A humbucking pickup, humbucker, or double coil, is a type of electric guitar pickup that uses two coils to "buck the hum" (or cancel out the interference) picked up by coil pickups. Most pickups use magnets to produce a magnetic field around the strings, and induce an electrical current in the coils as the strings vibrate (a notable exception is the piezoelectric pickup). Humbuckers work by pairing a coil with the north poles of its magnets oriented "up", (toward the strings) with a coil which has the south pole of its magnets oriented up. By connecting the coils together out of phase, the interference is significantly reduced via phase cancellation. The coils can be connected in series or in parallel. 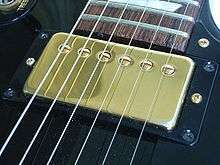 In addition to electric guitar pickups, humbucking coils are sometimes used to cancel hum in dynamic microphones. Hum is caused by the alternating magnetic fields created by transformers and power supplies inside electrical equipment using alternating current. While playing a guitar without humbuckers, a musician would hear a hum through the pickups during quiet sections of music. Sources of studio and stage hum include high-power amps, processors, mixers, motors, power lines, and other equipment. Compared to unshielded single coil pickups, humbuckers dramatically reduce hum. The "humbucking coil" was invented in 1934 by Electro-Voice, an American professional audio company based in South Bend, Indiana that Al Kahn and Lou Burroughs incorporated in 1930 for the purpose of manufacturing portable public address equipment, including microphones and loudspeakers. In 1938 A.F. Knoblaugh invented a pickup for stringed instruments involving 2 stacked coils (US Pat. 2,119,584). This pickup was to be used in pianos, since he was working for Baldwin Piano at the time. The 1939 April copy of "Radio Craft Magazine" shows how to construct a guitar pickup made with two identical coils wrapped around self magnetized iron cores, where one is then fliped over to create a reverse wound, reverse polarity, humbucking orientation. The iron cores of these pickups where magnetized to have their north-south poles at the opposite ends of the core, rather than the now more common top-bottom orientation. 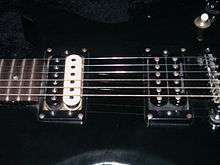 To overcome the hum problem for guitars, a humbucking pickup was invented by Seth Lover of Gibson under instruction of then president Ted McCarty. About the same time Ray Butts developed a similar pickup that was taken up by Gretsch guitars. Although Gibson's patent was filed almost 2 years before Gretsch's, Gibson's patent was issued 4 weeks after Gretsch's. Both patents describe a reverse wound and reverse polarity pair of coils. A successful early humbucking pickup was the so-called PAF (literally "Patent Applied For") invented by Seth Lover in 1955. Because of this, and because of its use on the Gibson Les Paul guitar, the humbucker is strongly associated with Gibson, although humbuckers have been used in many different guitar designs by many different manufacturers. Humbuckers are also known as dual-coil, double-coil, or hum-canceling pickups. Rickenbacker offered dual coil pickups arranged in a humbucking pattern beginning in late 1953 but dropped the design in 1954 due to the perceived distorted sound. The Gibson Les Paul was the first guitar to use humbuckers in substantial production, but since then, even some models of Fender Stratocasters and Telecasters, traditionally fitted with single-coil pickups, are factory-equipped with humbuckers. Stratocasters fitted with one humbucker in the bridge position, resulting in a pickup configuration noted as H-S-S (starting at bridge pickup: H for humbucker, S for single coil) are referred to as "Fat Strats", because of the "fatter", "rounder" tone offered by the humbucking pickup. In any magnetic pickup, a vibrating guitar string, magnetized by a fixed magnet within the pickup induces an alternating voltage across its coil(s). However, wire coils also make excellent antennae and are therefore sensitive to electromagnetic interference caused by alternating magnetic fields from mains wiring (mains hum) and electrical appliances like transformers, motors, and computer screens. Guitar pickups reproduce this noise, which can be quite audible, sounding like a constant hum or buzz. The direction of voltage induced across a coil by the moving string depends on both the coil winding direction and the polarity of the fixed magnet. On the other hand, the direction of current induced by external fields is only dependent on the direction of winding. Therefore a humbucker has two coils wound in such a way to cancel hum and maximize signal when they are connected. By convention humbucker coils are both wound counterclockwise, however typically the outside ends of the coils are connected together so that the coil starts are out of phase. The magnet in the two coils is arranged with opposite polarity so that the string motion induces voltages across both coils that become additive when the coils are wired in this manner. Electromagnetic interference induces the same voltage across both coils. When the signals from both coils are summed together, the two noise voltages cancel while the signal voltages add. This dramatically improves the signal-to-noise ratio. The technique has something in common with what electrical engineers call "common-mode rejection," and is also found in the balanced lines used in audio equipment. Humbuckers on a Gibson Invader. Many solid-body guitars feature cavities only for single-coil pickups. Installing full-sized humbuckers in this type of guitar requires additional routing of the woodwork and cutting of the pickguard (if the instrument has a pickguard). If the process is not carefully done, the instrument's body and pickguard may be damaged. For most guitarists, this is unacceptable; especially for expensive vintage guitars where it is vital to preserve cosmetic appearance. As a result, many pickup manufacturers now produce humbucking pickups compacted into the size of a single coil, accomplished by vertically "stacking" the coils instead of placing them side-by-side as in a regular humbucker. Many different kinds of stacked humbuckers are available from several manufacturers, producing a wide range of different tones. Another design known as rail humbuckers divides a single coil-size pickup in half lengthwise, and the windings are wound around two pole pieces, typically resembling a rail. These pickups look like a normal, albeit smaller, humbucker. This, however, is typically used in conjunction with stacked humbuckers, to produce a high-output pickup. This design can also extend to a "quadrail", by using a rail humbucker for each "single coil" of a normal humbucker. The same type of rails can also be found in a normal-size humbucker, however. Heavy metal guitarist Dimebag Darrell made heavy use of this type of pickup wired in the bridge position. These tend to also sound fuller and have a higher output and attack than the single coil-size version. Coil splits are often wrongly referred to as a "coil tap". Coil taps are most commonly found on single coil pickups, and involve an extra hook-up wire being included during the manufacture of the pickup so the guitarist can choose to have all the windings of the pickup included in the circuit, for a fatter, higher output sound with more midrange; or switch the output to "Tap" into the windings at a point that is less than the full coil for a brighter, lower output, cleaner sound. For example: a full pickup coil may be 10,000 turns of wire and the "Tap" may be at 8000 turns. Because of the confusion between coil splits and coil taps—and the rareness of coil taps in general—it is difficult to find tappable single coil pickups for sale. However, pickup manufacturer Seymour Duncan offers tapped versions of many of their Telecaster and Stratocaster pickups on their website at an increased cost. Gibson Firebird pickup – inspired by the Epiphone pickup, and shares its basic dimensions, but is different in terms of design, appearance, and tone, utilizing single blade pole pieces. Many instruments will use a combination of separate single coil pickups in a hum reducing configuration, where the magnetic polarity is different and the coils are electrically reversed. This arrangement is similar to that of a humbucking pickup and noise is effectively reduced. Some examples of this are the Fender Jazz Bass, introduced in 1960, which has used a pair of single coil pickups, one near the bridge and another one about half way between the bridge and the neck, and many Stratocaster style guitars, which often have 3 pickups with the middle one reversed electrically and magnetically. The (usually) 5-way selector switch allows 2 humbucking settings, where the reversed middle pickup is used in parallel with either the bridge or neck pickup. In 1957, Fender introduced a split pickup to its Precision Bass, which was wired in humbucking fashion, with one coil serving the E and A strings, the other the D and G strings. Both coils pick up the same hum, but since each string is only served by one coil, a single-coil sound is provided. The concept of this later expanded to G&L's Z-coil pickup, which is used for standard guitars such as their Comanche model. In 1985, Lace Music Products introduced the Lace Sensor pickups, which utilize a proprietary hum-screening bobbins to reduce hum while preserving single-coil tone. In 1996, Kinman Guitar Electrix introduced replacement pickups for Stratocaster and Telecaster guitars. These were of the stacked humbucker design, where the lower pickup coil functions solely to cancel hum. ↑ Mix, June 17, 2005. "Al Kahn (1906–2005)". Retrieved on August 24, 2009. ↑ Kendall Ford "A Home-Made String-Music Pickup" Radio Craft Magazine, April 1939 p.601,624-5. ↑ "Patent US2896491 - Magnetic pickup for stringed musical instrument". google.com. ↑ "Patent US2892371 - Pickup". google.com. ↑ "Seth Lover interview 1978 vintage gibson PAF humbucking humbucker pickups guitars". Provide.net. Retrieved 2013-05-02. ↑ Lawrence, Robb. The Early Years of the Les Paul Legacy 1915-1963. Hal Leonrd Corp. p. 107. ↑ "Humbucker Pickups". Kinman. Retrieved 2013-05-02.